At the end of the working life of the product Polar encourages you to minimize possible effects of waste on the environment and human health by following local waste disposal regulations and, where possible, utilizing separate collection of electronic devices. Do not dispose of this product as unsorted municipal waste. The A360 has an internal, rechargeable battery. Rechargeable batteries have a limited number of charge cycles. You can charge and discharge the battery over 300 times before a notable decrease in its capacity. The number of charge cycles also varies according to use and operating conditions. 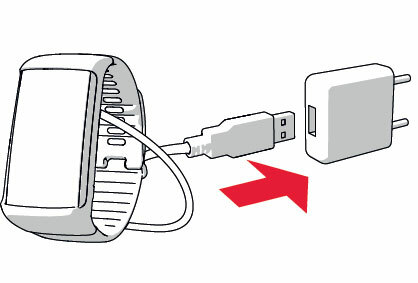 Do not charge the battery in temperatures under 0°C or over +40°C or when the USB port is wet. You can charge the battery via a wall outlet. When charging via a wall outlet, use a USB power adapter (not included in the product set). If you use a USB power adapter, make sure that the adapter is marked with "output 5Vdc" and that it provides a minimum of 500mA. Only use an adequately safety approved USB power adapter (marked with "LPS", "Limited Power Supply", "UL listed" or “CE”). To charge with your computer just plug your A360 to your computer and at the same time you can have it synced it with FlowSync. Push down the top part (A) of the USB cover inside the bracelet to access the micro USB port and plug in the supplied USB cable (B). 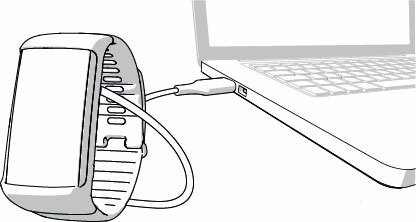 Plug the other end of the cable into your computer's USB port. Check that the USB port is dry before connecting it to the computer. If the battery is completely empty, it takes a couple of minutes for the charging to start. After syncing, green battery icon animation begins to fill up on the display. When the green battery icon is full, the A360 is fully charged. Don't leave the battery fully discharged for a long period of time or keep it fully charged all the time, because it may affect the battery life time. The battery operating time is up to 12 days with 24/7 activity tracking and 1h/day training without Smart Notifications on. The operating time depends on many factors, such as the temperature of the environment in which you use your A360, the features you use, how much the display is on and battery aging. The operating time is significantly reduced in temperatures well below freezing. Wearing the A360 under your overcoat helps to keep it warmer and to increase the operating time. The battery charge is low. It is recommended to charge A360. The charge is too low for recording a training session. A new training session cannot be started before charging A360. When the display doesn't wake up from a wrist gesture or a press of the button, the battery is empty and A360 has gone to sleep mode. Charge your A360. If the battery is totally drained, it may take a while for the charging animation to appear on the display.